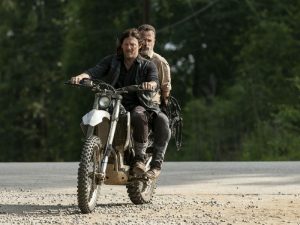 After Maggie sets out from Hilltop to see Negan face-to-face, Daryl tries to keep Rick away from Alexandria -- only to fall into a trap. Meanwhile Michonne visits Negan's cell, where she is confronted by her own past traumas. Last edited by GateWorld; October 30th, 2018 at 06:42 PM. This was a boring damned episode. Every part of it felt like forced going through the motions. I would of liked this episode more if they hadn't spoiled Rick's exit. I've read a lot of fan theories that he's going to be taken away by the helicopter, or fall into the water with the walkers off the bridge and be assumed dead so he can come back. I just don't see them pulling something like that with this particular character. I think with Rick he's gotta be all in or all out. Next week is going to be all heart string pulling. Yea pretty much, they even kept announcing *Next week in Rick Grime's last episodes* or *don't miss Rick grime last episodes*. Actor wanted out, can't blame him really. If anything the Rick ad on Sunday's show threw me off. Andy Lincoln is supposed to be in 6 episodes, but next week is only 905...and the ad said it's Rick Grimes's final episode. Yep, she wanted out as well. Well in sci-fi you never know, he might come back as a dream, spirit, flashback or whatever. I just find the whole idea of having Daryl as the leader laughable, also the abrupt hostility between him and Rick. Has it been announced hes in 6? Ive been avoiding stuff. There were rumours that AMC could decide to call it a day on the show, yet episodes three and four saw the number climb up and stabilise. This could be due to Rick’s eminent exit which is set to take place in next week’s episode. AFAIK it’s been confirmed for some time now that both Andy Lincoln and Lauren Cohan are only aboard for six episodes before their exits. I may be reading into things too much, but to me it feels like her desire to be gone from the show is really bleeding through to the character. I don’t know, it could just be how they’ve elected to write Maggie, but her exit from the show hasn’t been on the best of terms, so it’s all I can see when I see Maggie being unlikeqble. Well obviously the writing is gonna be sketchy since the writers probably had 5 more seasons to build arcs around these characters. You're right though, personally I thought Gregory's death was very premature and botched.